I have a confession: unlike my fellow tech reporters, I’ve never been totally convinced virtual reality was much more than a fad. Not that I don’t want it to succeed. I’ve lusted over the Oculus Rift, marveled at Microsoft’s HoloLens from afar, and had fun with the original Cardboard, but content has seemed too scarce, inconvenient, or uninteresting outside of solo gaming. Google’s VR push at this year’s I/O has started to convince me otherwise – the new Jump and Expeditions experiences in particular. Before we get to that, there’s that new Cardboard device. The hardware isn’t remarkably different – I mean, it’s still made out of paper – but it’s a notable improvement. The cardboard material is thicker, and it feels more durable as a result. It’s also slightly larger accommodate to 6-inch phones, which makes sense as it would be pretty odd if it couldn’t work with the company’s own Nexus 6. The design is a little different too. 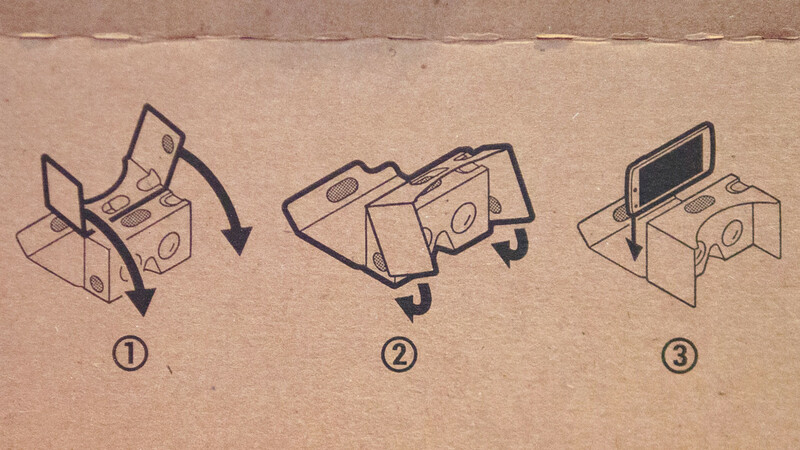 The folding process is now a lot easier, with just three steps printed right on the device. It’s quick to configure too, with a printed QR code that tell the Cardboard app how to work. And instead of the slightly finicky magnetic slider from last year, there’s a cardboard button on the upper right that works reliably and feels solid. The new button works by pushing a capacitive pad onto your touchscreen. The all-important lenses seem slightly clearer too when comparing them side-by-side with those on the old model.One side-note: these smartphone-based virtual reality headsets are probably the best argument for QuadHD+ displays on phones. Say what you will about pixel density not mattering past 300 ppi, but on the magnified split view of a VR headset, the difference between the G Flex 2’s 1080p screen and the Droid Turbo’s 1440p one were night and day. Both are still a bit blurry though, so we might just need 4K displays on phones after all. The new device is basically a better designed piece of cardboard. And it’s still pretty amazing that it just works. Google’s 16-camera GoPro Hero4 rig. The improved hardware is just a small piece of the puzzle. Cardboard is now a platform after all, and you’ll always be able to purchase a better headset if you want, or save money by making your own. Jump and Expeditions are Google’s takes on where VR can go. I went head-on with Jump first, Google’s new technology to create video for VR devices. It’s a doozy. The company partnered with GoPro to create a circular rig of 16 Hero4 cameras that render an image equivalent to “five 4K TVs playing at once,” or about 44 megapixels. Of course, we’ve already seen singular cameras that can record 360-degree video, but Jump’s many camera angles and some clever cloud processing mean Google is able to automatically convert the captured video into realistic 3D. It was utterly convincing in my demo. I saw no strange 3D conversion artifacts, and as the company describes it, “near things look near, far things look far.” I also didn’t notice any of the seams often found in panoramas no matter how many times I awkwardly spun around on the showroom floor looking for them. One second I was hiking through a mountain, the next I was riding on a cable car, and it was the most realistic VR video I’ve experienced, and I can’t wait to try out more when it comes to YouTube later this year. Sam Maxwell teaches takes his “class” of Google I/O attendees to Mars. While Jump made for an awesome technology showcase, Expeditions, Google’s platform for virtual field trips, is the perfect example of why it matters. The concept is pretty simple. Teachers hand out Cardboard devices to their students, select a location, and then highlight points of interest. Waiting for lesson to start. Students are free to look wherever they want on the panorama, but when a teacher sets a point of interest, a floating arrow will point you in the right direction should it be out of your current field of view. My own “classroom” went to Mars. One of Google’s engineers, Scott Maxwell, came to Google from NASA and piloted the Spirit and Opportunity rovers, so this wasn’t just a CG recreation; the demo features actual 3D panoramas captured by Spirit. As Maxwell passionately explained Spirit’s achievements and obstacles in traversing Mars – literally, it got stuck in a sandpit – I began to forget I was in the middle of a conference room holding a cardboard box to my face. I surely looked ridiculous, but so did the people around me, and it was the first time VR felt like a shared experience rather than a solo venture. It’s the closest I’ll likely ever get to actually being on Mars, and it was awesome. Text and photos can be powerful, but are usually perceived from a third-person point of view. Expeditions, on the other hand, makes you the observer, and has the potential to convince students the places they learn about aren’t just unattainable fantasies. It’s the type of experience that makes kids want to learn. While it won’t ever replace physically visiting places, it can at least help democratize learning experiences for kids and school who can’t afford expensive field trips – or a spaceship to Mars. Of course, other VR systems could replicate Expeditions (with better materials, too), but it’s hard to imagine a school paying for dozens of Oculus Rifts when some DIY Cardboard kits sell for less than $5 and can do 90% of the same thing. A Google representative said the company is still thinking about how to best promote Expeditions, but it already has several partners, including the American Museum of Natural History, the Smithsonian and the Palace of Versailles, and is already working towards getting the world out to schools and teachers. Educators will also be able to opt-in to try it later this year, and you can sign up to learn more here. When Cardboard was announced last year, it was largely seen as a fun experiment so anyone can try out virtual reality on the cheap, but with an SDK, hardware certification program, iOS support and now Jump and Expeditions, it’s clear Google wants to make VR a meaningful part of our everyday lives. It says a lot that two of my favorite VR experiences so far happened using a $20 piece of paper with a couple of lenses.